The fair way to clean your frame. Ecosponge can be put in the washing machine too! 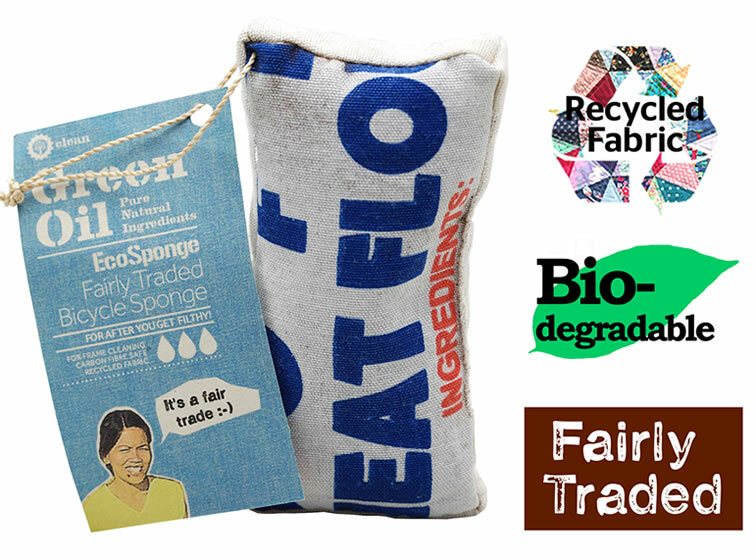 EcoSponge is the World's first fair trade bike product. This helps people in the Philipines, and it works a treat. - Internal fibres are from the luffa genus plant. The original Ecosponge was just a plant based sponge. It worked well, but had room for improvement. We then made a batch of Ecosponge 2, with coconut husk inside a fabric outer, but then the coconut husk supplier in the Philipines went broke. A short redesign produced Ecosponge 3 - the ultimate Ecosponge. It's also part of the Eco Rider Deluxe set. The World's greenest bicycle product? Plant based: The EcoSponge uses a plant based inner. This plant is indigenous to the Philipines and has to grow amongst other indignous plants. Growing these is therefore good for the ecosystem. Recycled: The outside is made of recycled cotton. Litterally, every Ecospone is completely unique! They are largely made from reclaimed cottong rice sacks. This is super soft for frame cleaning, and tought enough to wipe down your frame too. Everyone Ecosponge is unique and upcycled! Compostable: The Ecosponge is biodegradable after many years of use and can go on your compost heap if it ever wears out. It is petrochemical free, so you're not putting fragments of petrochemicals into the environment when using it as you would with a standard plastic sponge. The Ecosponge is our only fair trade product, because the term 'fair trade' doesn't generally apply to things produced rich countries like the UK, or products from large factories where a different set of ethical labour codes are applied. Simply, the UK and similar countries have a minimum wage and a welfare state which generally apples fair trade principals in law. 'Fair trade' applies to processed farm products, and things made by hand in developing countries. Like coffee, or little wood toys for example. The Ecosponge is the only Green Oil product made outside of the UK. It is made in the Philipines and its production adheres to the ten principles of fair trade, listed here. Its basically about treating workers well and giving them long term prospects to alleviate poverty.The Ecosponge helps the economy of the Philipines. Receiving a fair income from fair trade products means extra cash to save for a rainy day (sometimes literally with the 2013) to buy food, investment in education, contraception and a host of other good things. You can find out more on the World Fair Trade Organization website. Basically, fair trade is about breaking the cycle of poverty. Green Oil has a moral purpose as well as a profit motivation, so fair trade is something we strongly support in principal. Why not use a natural sea sponge? Too many people want sponges from the bottom of the sea, and people taking too many is damaging the ecosystem in various places. After use, dry out your Ecosponge indoors or in the sun. The Ecosponge label is thin card, easily recycled. The Ecosponge itself is compostable. If you don't have a compost bin, you can just bury it! Why is there a picture of a sheep on the label? You get to see a lot of sheep when riding, and a Baah Code is more entertaining than just a bar code!